RadVirtualGrid provides you with a selection functionality, which allows the user to select one or more items (rows or cells) from the data displayed by the control. To select an item in RadVirtualGrid click in the rectangle area of the desired row. By default the user can select only one row (the entire row is selected). After setting this property, to select a cell in RadVirtualGrid, click the desired cell. SelectionChanging: fires before the selection is changed. SelectionChanged: fires after the selection is changed. CurrentCellChanging: fires before the current cell is changed. CurrentCellChanged: fires after the current cell is changed. ClearSelection: clears all selected items. IsSelected: you can use the this method to check if particular cell is selected. 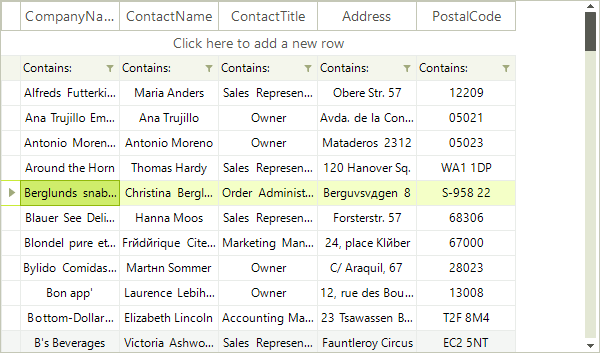 RowContainsSelection: use this method to check if a particular row contains the selected cell. SelectAll: use this method to select all cells. CurrentRowIndex: gets the current row index. 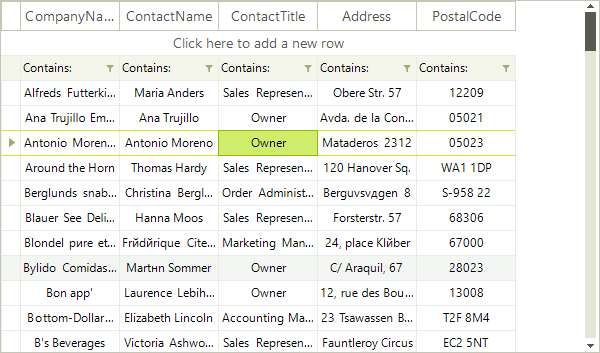 CurrentColumnIndex: gets the current selected column index. SelectedRegion: returns the first selected region. SelectedRegions: returns all selected regions.